Mirror photo by Gary M. Baranec / Estelle “Stella” Shubella celebrates her 100th birthday with her son, Richard, at the Hollidaysburg Veterans Home on Wednesday. Shubella served the United States by working as a riveter during World War II. DUNCANSVILLE — November was the 100th anniversary of the end of World War I, and Wednesday was the 100th anniversary of the birth of a woman whose activities a generation later in World War II help illustrate the difference for the U.S. between those great conflicts. 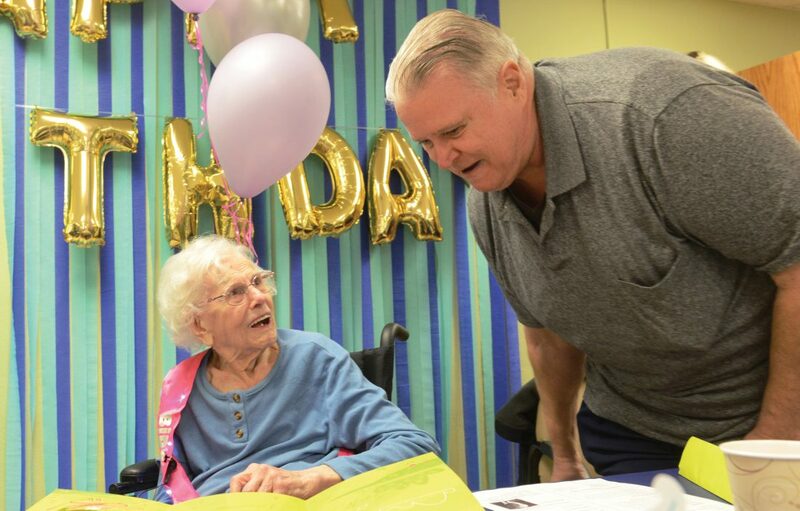 Maj. Gen. Tony Carrelli, Pennsylvania’s adjutant general, talked about that difference Wednesday at centenarian Estelle “Stella” Shubella’s birthday party at the Hollidaysburg Veterans Home. The U.S. entered World War I, which lasted a little more than four years, about a year and a half before it ended, sending units like Pennsylvania’s 28th Division — now under Carrelli’s command — to fight in the trenches. But the war wasn’t all-encompassing here at home. It was different during World War II, which lasted six years and involved the U.S. over the last four. There was fuel and oil rationing, collection drives for rubber, silk and steel, raw materials for munitions and armor, and a transformation of the industrial base from manufacture of cars and bridges and tractors to the making of airplanes and ships and tanks, Carrelli said. Because so many U.S. men signed up or were drafted, the nation called for women to help at home. “Those that stayed, they had to contribute,” Carrelli said. Shubella was among those: she heeded the call and headed from her native Windber with her sister and other women to New York City for work in a defense plant, where she became a riveter making airplane parts to support the war effort, according to her son, Richard, who was at the party, and a news release from the home. Those women who went to work in industry bucked the norm, Carrelli said. Before the war, women made up just 1 percent of the aircraft industry workforce, according to history.com. By 1943, it was 65 percent, the website stated. Shubella continued to work in the defense plant — probably on Lockheed bombers — for almost the duration of the war, Richard said. “She was one of the ‘Rosie the Riveters,'” Richard said. Rosie was a half-real, half-fictional figure used to recruit women to defense work during the war, much like Uncle Sam was used to recruit men, according to online sources. Shubella went explicitly to contribute to the national struggle, said Sam Dunkle, the home’s deputy commandant. Meanwhile, Shubella’s boyfriend, Alexander — a Windber coal miner who became her husband halfway through the war — went into the Army, which sent him to the Pacific, where he served for two tours, became a master sergeant and was wounded, according to Dunkle and Richard Shubella. Stella Shubella, who declined to speak with the Mirror, was feted at the head table in a fair-sized room in Arnold Hall, where there were about 15 other tables at which were seated residents who were served cake. There was music — including polka, country and rock ‘n’ roll — and at one point a carousel parade, with residents pushed on wheelchairs around the perimeter by staffers, as at a wedding. Shubella’s mother advised her when she was young never to drink or smoke, because she’d never have to miss those vices, and to put money in the bank, because it would earn interest, Dunkle said. She complied with that advice, he said.